After watching the chicken three-ways elimination challenge on Masterchef Season 4 Episode 14 last week (Skip to 25:00 minutes or so to get to the challenge), I decided I wanted to give a go at making stuffed chicken that would make Joe Bastianich proud (hypothetically speaking, if he were to taste it, of course). To be honest, I never really cook chicken breast whole. I feel like there’s nothing more boring than a whole chicken breast, sitting there in all of its bland glory. Just a hunk of protein waiting to be eating. Where’s the fun in that? Don’t even get me started if it’s an overcooked, dry, hockey puck of a chicken breast (I’ve been to one too many weddings where quantity definitely trumped quality leaving me vowing never to check off chicken as my meal option). 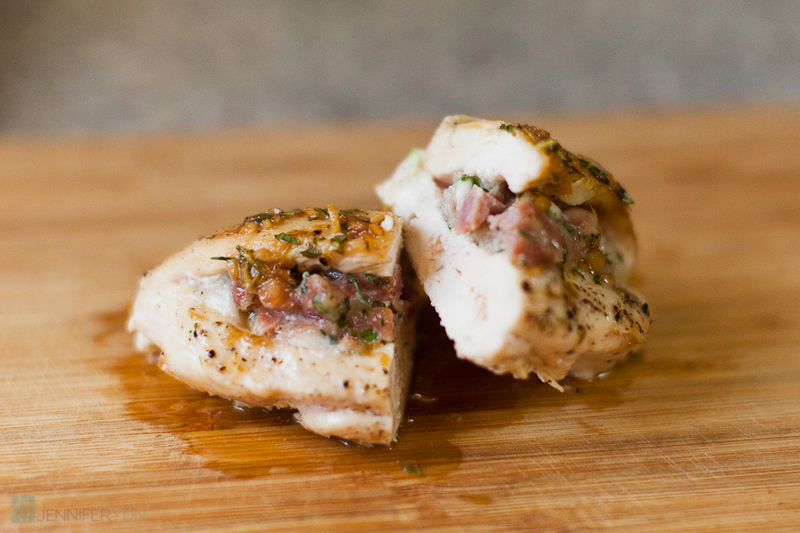 But I digress… let’s give stuffed chicken a go. I made this for dinner tonight. Not bad for a weeknight dinner. Took about 45 minutes total to prep (15 minutes) and cook (30 minutes) and the result was a deliciously moist and flavourful chicken breast. We had it with a good sized garden salad with balsamic dressing. It certainly filled me up and G really enjoyed it as well. A winner all around and a scrumptious leftover lunch to look forward to tomorrow. Rough chop the prosciutto and mozzarella and mix together in a mixing bowl. Add 1 tbsp of minced parsley and freshly ground black pepper (to taste). Carefully slice each breast length-wise, making a pocket. Take care not to slice completely through to the other side. Divide prosciutto mixture and stuff each of the chicken breast pockets and season each breast with salt and pepper. Heat the olive oil in a large skillet (do not use a non-stick skillet; important tidbit for making the glaze in a bit) over medium-high heat until hot. Add the chicken but do not overcrowd the pan (otherwise the chicken will steam instead of browning). Reduce heat to medium and cook each side for 3 minutes, turning once, until chicken is browned. Transfer chicken to a baking dish and bake in oven until chicken is cooked through, about 15-20 minutes. Let sit on platter. While chicken is baking, add garlic to large skillet used for browning chicken and sauté until softened and starts to brown (add a little oil if skillet is very dry but leave all the browned bits from the chicken in the pan; that’s the good stuff!). Add white wine and deglaze pan. (Just a note, if adding alcohol to the pan, remove pan from heat briefly whilst doing so. You may end up with singed eyebrows otherwise). Heat over high until reduced, about 5 minutes. Remove from heat and add parsley, thyme, lemon zest, and butter. Swirl around until butter is completely dissolved. Pour small amounts over chicken before serving. Recipe keynotes: The acidity of the lemon herb glaze balances the richness of the prosciutto and mozzarella nicely. The butter adds a richness to the glaze without being overpowering.